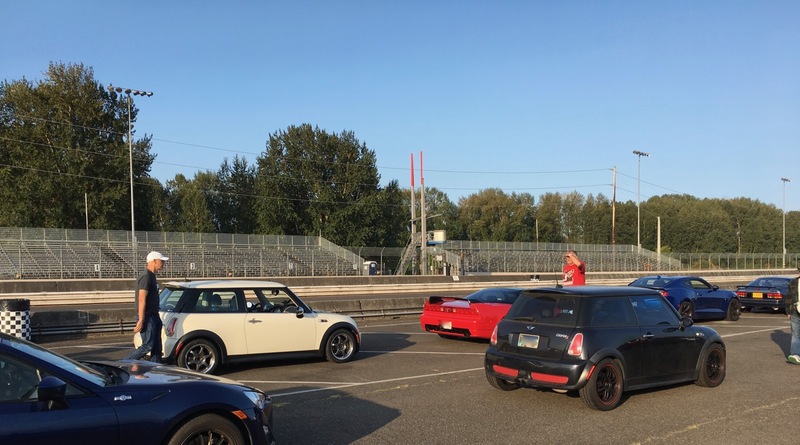 We have a nice group of R53 here that regulars at PIR. The best part is our cars are all very close with very little drivetrain mods. Strangely I have yet to see a JCW on track. In total I have seen 8 R53s and 1 R50 at PIR. There are a few R56s but not that regular. Additionally there is a monster Mini built on a R50 or R50 chassis by RMW with no expense spared. This post should have been written as the first in these few posts on this past week's 2 days of fun and excitement for Desire and me - the handler of the wild-at-heart beast. What are new are the RE71Rs and SS caliper pistons. As the tyres were new I reminded myself to not push them too hard. Also the uncharted territory also was the cost-reduced tyre mounting and balancing. To be honest, I tactfully asked them why they only put weight on the inboard side when the machine clearly indicate the outside requires weight? Scott the owner said they only do so if it exceed a certain limit. I told them my wheels are for PIR and he said they serve PIR youngsters all the time and have no issue. I didn't want to push too hard. I will work with them in repeat business. When I drive the Mini on the road with the new tyres, I can tell there is some vibration. It can be the balancing, but more likely other factors. Driving at PIR the tyres and steering wheel are as smooth as any, and I had switched front with back between the two days. So how did the SS caliper piston work out? The difference is no more boiling Motul 600 fluid. I used to measure as high as 600F on the caliper body near the outer brake pad, now I measure 300ish F after a cooling lap. I am quite sure boiling fluid is behind us with this and I should be able to use the more reasonably priced Wilwood fluid purchased in bulk. For completeness sake here are the videos on all 4 sessions of the first of the two days driving fun, in reverse chronology. There was a bad apple driver who should not had been in the run group. Everyone else were just great and we all had a great cool day at the track. Desire was the only Mini in this HPDE day.